American Shanty Towns and Tent Cities Emerge Outside L.A.
BBC NEWS | Americas | Tent city highlights US homes crisis — This is similar to the kinds of slums and makeshift favellas you find in the third world. The BBC News associates this development with the mortgage crisis. They are wrong. This is a result of open borders combined with an already existent homeless crisis. It’s also apparent that the middle class is shrinking to zero and will no longer be a buffer between the poor and the upper class. Next stop: Mexico City type plague of kidnappings of business executives. Get ready for that. Were you in the news because you made $200 million dollars? Expect to get kidnapped and tortured. Seriously. 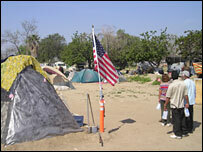 Forty miles east of Los Angeles, on a patch of waste ground, is the place they call Tent City. Sandwiched between the local airport and the railway line, this really is the wrong side of the tracks. We are on the outskirts of Ontario, California a functionally pleasant commuter-city in southern California. Last summer, local officials established this camp as a temporary base for the citys homeless population, then around two dozen. But word spread and now some 300 people live here. It has an air of scruffy permanence, and indeed, city officials say there are no current plans to close it down. Most residents live in tents, some in mobile homes in various states of disrepair, their possessions crammed in with them or spread out on the ground. Note. The “no current plans to shut it down” is how the favellas of Brazil became cities within cities run by gangs. They are now too big to be removed and pose a threat to society. There was a similar type of community forming in the SF Bay Area which was luckily destroyed one night by a large-scale raid. stupid rich people don’t think i deserve a decent living with my six children. i wish there was a way we could just tax the rich so i wont take any money from the middle class. those people in the tents are american and they should get some sort of welfare check and free heath care. why should only rich people get health care? it would be cheaper to give them all health care now rather than waiting for them to go to the emergency room. There are plenty of immigrants who are able to “make it” in USA, even without higher education nor basic english. In my old neighbourhood there was a middle-age couple of immigrants from Poland, and in less than 10 years they were able to get mortgage for a $250k house. Yes, it was the smallest house on my street, but it was a house nevertheless. We also had a mixed Slovak/Asian and a Mexican familiest, all of them were “normal” decent and hard-working people too. Most of them didn’t speak more than 10 words in English! If these people, with their minimal knowledge of language, often without any recognizable education, if they were able to make a living here – there are absolutely no valid excuses for most of any Americans to live in a shanty towns or such. Face it: if you are a healthy white american and you are on a welfare, or live in a tent or such, there is something wrong with YOU. Why do you want rich people to pay for your six kids? If you can’t afford them, don’t have’em, ain’t it simple? BTW: have you ever heard of a inventions called condoms, pills, vasectomy etc? Only the stupid are breeding more than they are able to handle. Bad Behavior has blocked 13965 access attempts in the last 7 days.